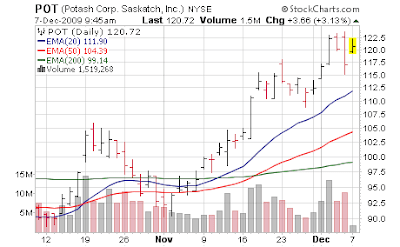 About 2 weeks ago we noted Potash (POT) looked poised to breakout [Nov 17, 2009: Potash Could be on Verge of Breakout] over a "double top" of $106, which it began doing within hours (we started the position once that happened). So far it has been a pretty good run here, although speculators have run into the Chinese agriculture stocks (SEED, FEED, CGA, YONG, et al) as they always do whenever fertilizer gets hot. Many of these type of stocks will run 50% and lose it all once the tide turns so as long as you find a chair before the music stops they are fun for speculative reasons. However, Potash and Mosaic (MOS) [and to lesser degree Agrium (AGU) or Intrepid Potash (IPI)] are the key ways to play my favorite subsector (outside of land itself) in agriculture - which is potash. We have, literally, a hundred posts on the subject of why potash (the nutrient) has a huge moat around it [Nov 16, 2007: Potash Expands Mine for $2 Billion] and is one of the most compelling investment ideas for a 5, 10+ year time frame so you can click on the label for this entry or search archives by topic if newer to the blog (much of this was discussed in latter 2007 or first half 2008). Mosaic and Potash were 2 of our big winners from summer 2007 through summer 2008, and just about the time they hit the mainstream press was "the top" [Apr 30, 2008: Finally (A Year Late) Fertilizer Hits the Front Page of the NYTimes] [Apr 23, 2008: Potash Hits $1000 on Spot Market]. That was about the time I became very worried about the sector as very crowded which I detailed in the April 23rd piece. In retrospect, that was a correct assessment. Also keep in mind Potash is the 3rd largest position for investing legend George Soros. Goldman Sachs is upgrading Potash (NYSE:POT) to Buy from Neutral with a $140 price target. According to the firm the upgrade is based on an improved demand outlook for potash in 2010 both in the US and globally. Over the past few weeks, datapoints have confirmed returning demand and they believe POT offers the most attractive way to play a potash recovery. Goldman believes US farmers will significantly increase applications vs. significantly weak 2009 rates, and worldwide demand should pick up following the long-awaited China contract settlement. Finally, investor sentiment on fertilizers has improved meaningfully, yet they believe we are still in the early phase of this upcycle. Firm sees 20% potential upside to their $140 price target. (1) The impending China contract settlement should serve as a major catalyst for the global potash markets and fertilizer stocks. This could come as soon as this month, but we more conservatively expect a settlement by mid-February. Settlement of the China contract will give retailers and dealers’ confidence in restocking inventories throughout the supply chain. Given recent improved demand trends, including higher prices in the Chinese domestic markets, they believe the risk of a damaging contract settlement is diminishing. When the contract settlement finally occurs, they expect it to set off a global demand spurt as buyers will come out of the woodwork to secure potash for 2010. Buyer confidence is key to the market right now, and until the China contract settles, uncertainty remains. That said, similar to the US, Goldman believes farmers across the globe are likely to return to the market and buy potash for 2010 application. Recent anecdotes from their China analyst suggest that the domestic potash market in China has thawed in recent weeks and demand is pulling inventory through the supply chain. Producer inventories have fallen meaningfully, according to Goldman China analyst, and are now about 3 million mt vs. the prior estimate of an excess of 4 million mt due to inventory draw downs during the recent weeks. Accordingly, prices have recently strengthened within China—from $350/mt up to $425/mt (at the retail level) depending on quality (with Canadian potash receiving a premium). (2) Investors are likely underestimating the 2010 US demand recovery that could see staggering yoy percent increases in volume given the depth of the 2009 reduction and the atypically weak fall consumption levels. Over the past 4-5 weeks, they have spoken to many industry contacts—from farmers to producers—and sensed a critically important sentiment change within the fertilizer industry that potash demand is returning, and that fears of another decline in application rates are overblown. After spending time in the field over the last few weeks and discussions with various industry contacts, the firm ise now highly confident that farmers do not doubt the need to replenish their soil, and will do so at rational prices. Goldman views Potash Corp. as the best way to play a rebound in the global potash markets given its high earnings leverage to potash prices and volumes as well as being the natural large market cap choice for investors looking to gain exposure given its size and trading characteristics. Compared to Mosaic, POT has higher potash exposure; compared to Intrepid Potash, POT has a significant market cap advantage ($37bn vs. $2.5bn) as well as much lower unit production costs. They believe that POT is portfolio managers’ ideal choice for potash exposure. After the recent run, which was NOT accompanied by a rise in estimates, fertilizer stocks look significantly more expensive than just a couple of months ago. Of course, the same can be said across the market if looking back to the March 2009 lows. Goldman notes they are conscious, however, of the role sentiment plays in these names, which can lead to seemingly stretched valuations relative to historical standards based on investor expectations for upward earnings revisions. In POT, for example, downward earnings revisions over the past three months have come hand-in-hand with higher multiples and significant stock appreciation as investors willingly look past any near-term earnings weakness and toward the rebound potential for 2010 and beyond. Goldman's $140 target is the new Street high target for POT.